If you are looking to share your geographic data as mobile-friendly interactive maps or looking for an alternative to the discontinued Google Maps Engine service, Maptitude now offers a simple, open solution that puts you in total control of your maps, without locking you into any map service. Maptitude is a Geographic Information System (GIS) desktop application that is very easy to use. With Maptitude, you can quickly import, geocode and visualize your data on a map, whether it is stored in an Excel spreadsheet, a Shapefile, a KML file or an SQL database (more…). 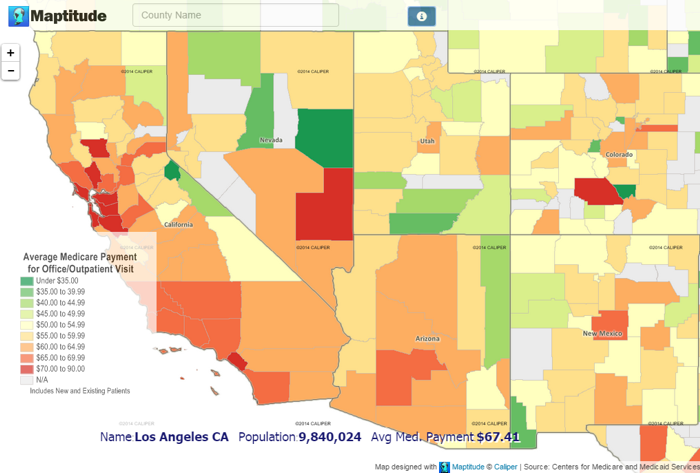 You can then create beautiful thematic maps. Finally, you can save your map and your geographic data as a Mapplication, a fully functional interactive map for the web. A Maptitude Mapplication is a great way to publish your geographic data. It’s scalable, affordable and has open source elements. A Mapplication folder is completely self-contained and does not require access to mapping services. What this means is that you can share all your maps as Mapplications over your enterprise network or host them on your own web servers. There are no special server-side requirements. You can even zip and email a Mapplication folder or share it on the cloud using Dropbox or Google Drive. How do I Create Mapplications? As an addon to Maptitude, which you can license to create any number of Mapplications. Each license is for a single entity or organization and can be renewed annually. One Mapplication at a time, which Caliper can help in creating and customizing. Please contact Maptitude Sales. We will be happy to discuss your requirements and price a solution accordingly. Technical Stuff: What is a Mapplication? Maptitude can turn maps into interactive Leaflet Mapplications. A Mapplication is a single page HTML application that bundles your map and your geographic data using open standards and technologies. A Mapplication includes an interactive Leaflet.JS map, tile images in Web Mercator projection, and a selection of your geographic data translated to GeoJSON. The map background colors, labels and themes are stored as a set of tile images, while your data in the active foreground layer stored in GeoJSON. You don’t have to write any code to produce a functional interactive map. You may customize the output produced by a Mapplication using popular open HTML technologies: AngularJS, Leaflet, Bootstrap, and GeoJSON. Maptitude Leaflet Mapplications allow developers without a GIS background to very easily create tiled web maps with optional overlays, and to display them via hosting on a server. Maptitude supports data in almost any format (more…) and the styles of the data can be fully customized within a map. These maps are used to publish the interactive Mapplication layers such as markers with clickable popups. Like other web map libraries, the basic display model implemented by a Maptitude Mapplication is to have one base-map of your choice, plus zero or more transparent overlays (e.g. territories), with zero or more vector objects (e.g. customers or stores) displayed on top. The desktop Maptitude software can create and manage your territories and location data, which can then be shared and published as a Maptitude Leaflet Mapplication. We have found that Mapplications are the preferred way to share maps across an organization. We price such Mapplications based on client requirements. We would be happy to work with you on creating the Mapplication you require. Please contact Maptitude Sales to start sharing your maps.